Postcard from Naples 13 - What? What kind of a cruel hoax is this?! Friend Peter, who sent me the first card in this series also sent this one, but I think he's testing me. This is not only NOT a period postcard, I'm pretty sure it's not a postcard at all. Boo-hiss! 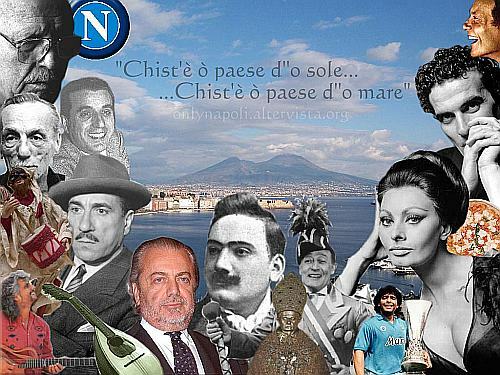 It's a collage of well-known icons of Naples, both persons and things, slapped onto a shot of the bay of Naples that might even be from this morning. Also, this rectangular format is wrong, but, ok, maybe you could make a card out of it. Tourists will buy anything. However, the URL of a local website ("onlynapoli.altervista.org") dedicated to the Naples football (soccer) team is imprinted faintly on the image. Also, there are some other prominent football references (named below), so I think this is a product of the Societa' Sportiva Calcio Napoli, the Naples Football Sports Society (that large letter N at top left is their logo! )—or some insane sports nut who shills for them. The prominent printing on the card is a bit more interesting. These are the first and second lines of the refrain of a well-known song in dialect: Chist ' è ò paese d''o sole, (This is the land of the sun). The lyrics are by Libero Bovio, one of the best-known Neapolitan dialect poets of the twentieth century. The music is by Vincenzo D'Annibale. There are numerous recordings of it. The photos, clockwise from upper right (click on links where applicable): singer and actor Massimo Ranieri (still very popular), Massimo Troisi (the great comic, who died way too young), a pizza, Sophia Loren (really from Pozzuoli! ), Diego Maradona (more football! - he played for Naples from 1984-91 and led the team to two national championship titles), Totò (the best-loved Italian comic ever), a silver bust of San Gennaro, the patron saint of Naples, in the Naples Cathedral. It was donated by Charles II of Anjou in 1305, Enrico Caruso, Aurelio De Laurentiis (film director and president of the Naples football club - even more football! ), a mandolin, singer Pino Daniele, Peppino de Filippo, Pulcinella playing a putipu (rhythm instrument described here), playwright Eduardo de Filippo (they still owe him a Nobel prize! ), Roberto Murolo (singer and scholar of the Neapolitan song), and—hey! I'm not sure, but it looks like singer Bruno Venturini (b. 1945) well-known singer of Neapolitan music. And, as I mentioned, at the top is that damned sports logo.